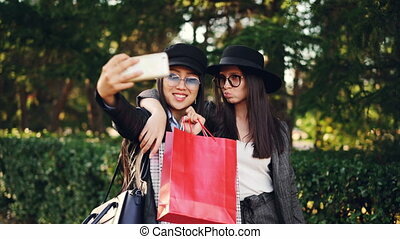 Excited female friends are taking selfie using smartphone and holding shopping bags with purchases on sunny autumn day. Modern technology and youth lifestyle concept. 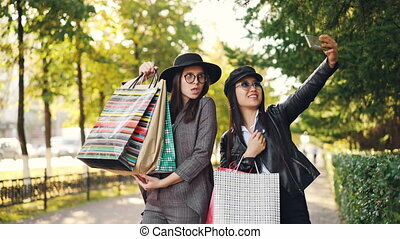 Excited female friends beautiful girls are taking selfie with smartphone and holding paper bags with purchases on autumn day. Modern technology, shopping and youth concept. 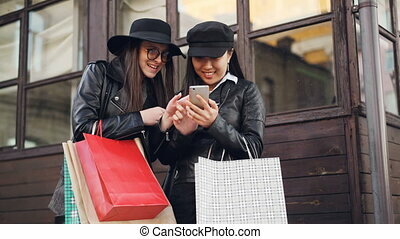 Excited girls friends are using smartphone touching screen standing in the street and holding shopping bags on autumn day. Modern technology and youth concept. 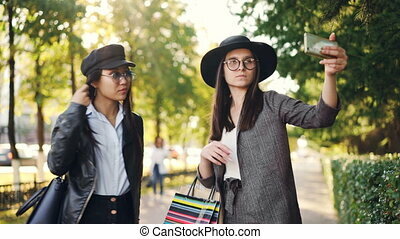 Attractive Asian girl is taking selfie with her Caucasian friend after shopping day holding bags and using smartphone. Modern lifestyle, technology and happy youth concept. Excited girls are making online video call using smartphone holding device and showing shopping bags with purchases. Communication, modern technology and fun concept. 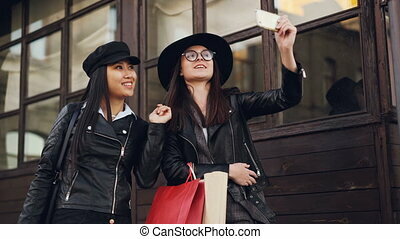 Carefree girls are taking selfie using smartphone posing with shopping bags in the street wearing stylish clothes and laughing. Modern technology, consumerism and fun concept. Modern Asian woman is using smartphone texting friends sitting in street cafe on windy autumn day and smiling. Technology, communication and young people concept. 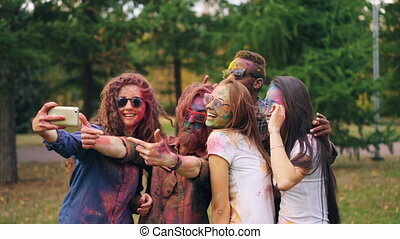 Slow motion of smiling young people dirty with bright paint taking selfie in park using smartphone. Holi festival, modern technology and happy youth concept. 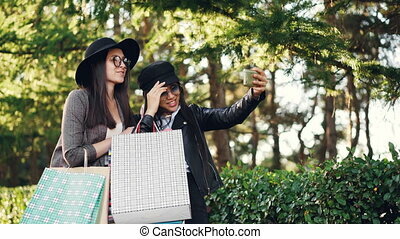 Happy young women friends are taking selfie with colorful paper bags standing outdoors on sidewalk and posing. Girls are using smartphone and wearing casual clothing. 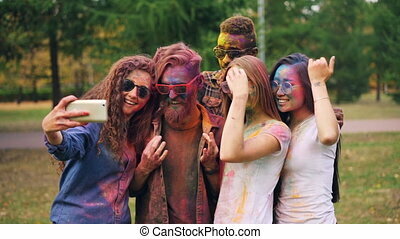 Happy men and women friends with painted faces and hair are taking selfie at Holi festival using smartphone camera, people are posing and smiling. Fun and modern technology concept. 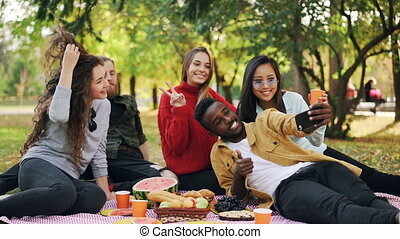 Slow motion of happy African American man taking selfie with friends on picnic using smartphone, people are posing with drinks and showing hand gestures sitting on plaid. 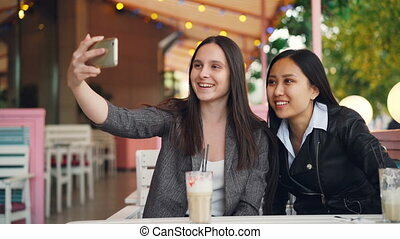 Cheerful female friends are making online video call with modern smartphone looking at screen and talking sitting in street cafe together. Communication and technology concept. 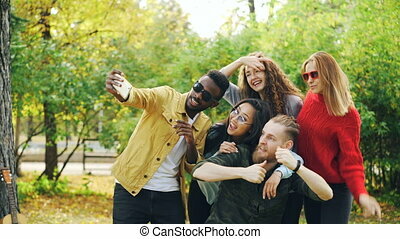 Playful youth men and women are taking selfie in park using smartphone, making funny faces and wearing sunglasses standing outdoors and laughing. Fun and autumn nature concept. 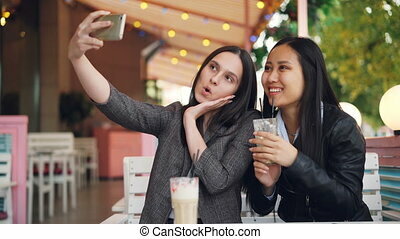 Attractive girl is taking selfie with her female Asian friend sitting in open-air cafe with drinks holding smartphone and posing with glasses. Friendship, technology and leisure concept. 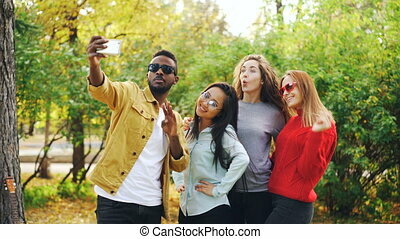 African American student is taking selfie with beautiful girls Asian and Caucasian standing in park, using smartphone and posing for camera. Youth, nature and photo concept. 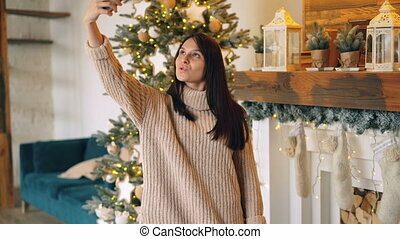 Beautiful young woman is taking selfie with smartphone on Christmas standing near decorated fireplace mantel and New Year tree. 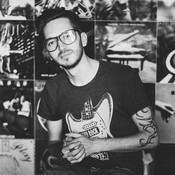 Holiday, youth and photo concept.